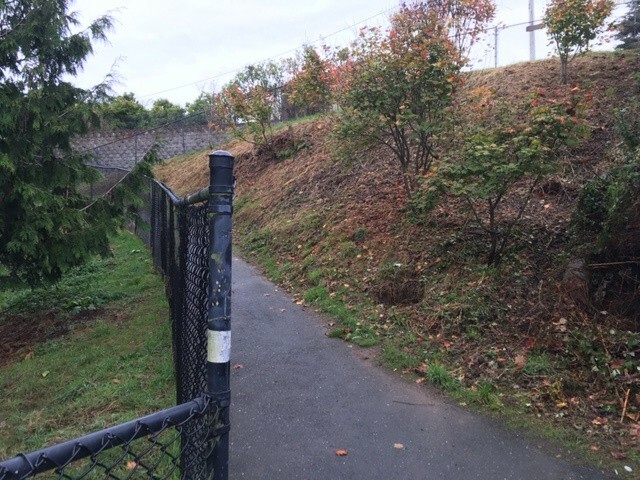 The switchback path to Arcata Elementary where a girl was attacked in September. Arcata residents expressed frustration at the changing character of their neighborhoods and what they perceive as an increased boldness in the crimes being committed on local streets during a Thursday night meeting with city officials that was spurred by a brazen attack last month on a young girl walking to school. While the focus was on the Westwood neighborhood where the 12-year-old student was using a path from Cahill Park to Arcata Elementary School, the crowd of nearly 100 came from throughout the city. The suspect in the attack, Dylan Jackson Wilson, faces charges of assault on a child with the intent to commit a felony and committing a forcible lewd act on a child. A court hearing is scheduled Monday for the receipt of a medical report on his mental competency. Attendees at Thursday's meeting were divided into three groups that focused on neighborhood watch, general policing and infrastructure needs, including clearing pathways that have become overgrown or known loitering areas. Mayor Paul Pitino, councilmembers Susan Ornelas and Michael Winkler, City Manager Karen Diemer, Environmental Services Director Mark Andre, City Engineer Doby Class and Julie Neander, deputy director of the recreation division, also headed or sat in on discussions. Many navigated to the law enforcement sessions — led by Police Chief Tom Chapman, Lt. Bart Silvers and Neighborhood Watch coordinator Ginger Campbell — to share their stories, ask for advice and look for solutions. Residents spoke about problem houses with drug activity, car break-ins day and night, and a general decline in their feeling of safety, including one woman who said someone opened a gate in the middle of the day and stole her running shoes right off the porch. Suggestions included forming parent patrols, joining or starting a neighborhood watch and using apps like SeeClickFix to share real-time information on problem hot spots by taking photographs. The main message from law enforcement and other city officials was for residents to get to know their neighbors, keep a watch out for suspicious activity and to call the city — and to keep calling — as problems arise. “The strength that we have is the neighbors being our eyes and ears,” Silvers said. Class agreed, saying the same applied to abatement issues at properties. Chapman told residents his department was aware of many of the city’s problem homes and that reporting incidents helps police create a record that can be used to build a case. Parent Kate Hutchings, a member of Arcata Elementary’s parent teacher organization who suggested using the SeeClickFix app to spread the word about concerns and issue areas, said the city has done quite a bit of work cleaning up the path where the attack took place. “I hope that momentum stays,” she said.